Please refer to the WSLHD Strategic Plan for performance and related publications. 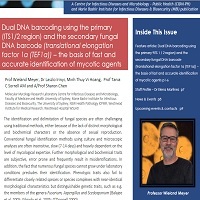 Dual DNA barcoding using the primary (ITS1/2 region) and the secondary fungal DNA barcode (translational elongation factor 1a (TEF1a)) – the basis of fast and accurate identification of mycotic agents. Topic Highlights Include: Food safety in summer - eating outdoors, Infectious diseases updates and Beat the heat this summer. Western Sydney Local Health District (WSLHD) provides public healthcare to more than a million residents in Sydney’s west as well as services to those outside our catchment from specialty statewide centres of expertise. Issue highlights include: The Landscape Epidemiology of Ross River Virus, Disease Outbreaks in Australia,Advances in the Biology and Management of Modern Bed Bugs and Staff Profile of Dr Justin Beardsley. Topic highlights include: What's new in seasonal influenza vaccinations in 2018, NSW school-based vaccination program (Gardasil9®, Boostrix and Menactra) and Managing the flu this winter - advice for your patients.